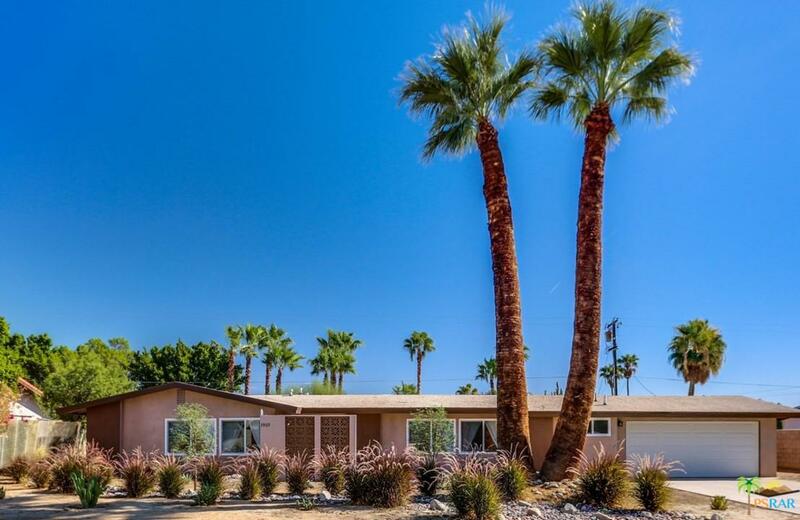 Wonderful Ranch style home under twin Palm Trees on a large private lot. Recently and completely renovated inside & out. Ready for immediate enjoyment. Inside you'll find an open kitchen/family room with ceramic wood like floors, quartz counters, new white cabinetry, stainless appliances and pendent lights over the breakfast bar. Formal living room overlooks the pool yard with partially covered patio & outdoor shower. 3 bedrooms with plush carpeting and 3 baths all done with beautiful tile surrounds, quartz counters & new cabinets. The backyard has a huge, inviting oval pool in a pretty yard with lots of patio area for lounging and play. Plus there is a 2nd yard for you to create whatever you desire. 2 car attached garage and long driveway. Great space in a convenient location to downtown Palm Springs as well as the rest of the Valley. FEE Land That You Own.